The plant hormone class, auxins, regulates three essential cellular fates in morphogenesis, elongation, division, and differentiation. Auxin-binding protein 1 (ABP1) is a receptor for auxin mediating auxin-induced cell elongation and, directly or indirectly, cell division. 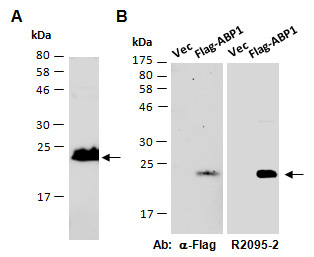 polyclonal antibodies were produced by immunizing animals with a GST-fusion protein containing the middle region of arabidopsis thaliana ABP1 (At4g02980). Antibodies were purified by affinity purification using immunogen. control (Vec) or Flag-ABP1 were used.